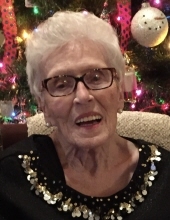 Mary Louise Britton, age 97, widow of E. L. Britton passed away Thursday, November 8th, 2018 at Morning Point of Richmond, where she had made her home for the past two and half years. She was born December 29th, 1920 in Berea, KY to the late Ben and Addie Bowling Fugate. Mrs. Britton was an avid UK Basketball fan, loved to play bridge and spend time with her family. She was also an advocate for animals, often taking supplies to the Madison County Humane Society. She was a member of the First Christian Church in Berea and was very active there until her health prevented. Mrs. Britton is survived by her daughters; Anne Britton Chambers and her husband Cliff of Miramar Beach, FL and Jayne Britton Smith and her husband Terry W. of Franklin, TN. Three grandchildren; Britt Chambers and his wife Tammy, Leslie Chambers both of Louisville, KY, and Casey Smith and his wife Elisa of Nashville, TN, two great grandchildren Ben and Abby Chambers both of Louisville, KY. The family wants to thank Elizabeth Madriz for her wonderful companionship and caregiving for the last 20 years. And the staff of Morning Pointe of Richmond. Graveside services will be 1:00 PM Tuesday, November 13th, 2018 at Berea Cemetery with Dr. Glenn Birkett officiating. Memorial contributions suggested to Hospice Care Plus 208 Kidd Drive, Berea, KY 40403. To send flowers or a remembrance gift to the family of Mary Louise Britton, please visit our Tribute Store. "Email Address" would like to share the life celebration of Mary Louise Britton. Click on the "link" to go to share a favorite memory or leave a condolence message for the family.